Home / Automotive / Cars / Fast And Furious Bloopers... No Calipers? Here's Why! As a true petrolhead and die-hard Fast and Furious fan, you will know that Jessie's Jetta had no calipers – ever wonder why? 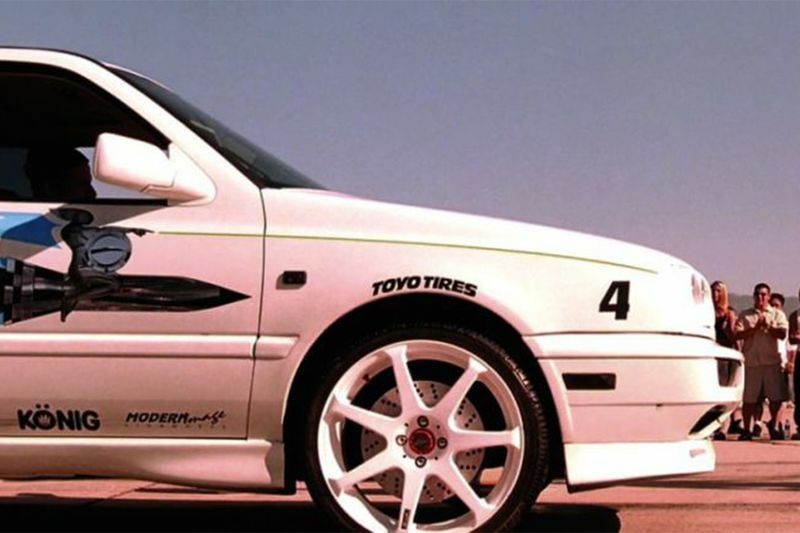 When we reported that Jesse’s VW Jetta from The Fast and the Furious had sold for $42,000 at auction, there was one detail we couldn’t help but notice: it actually had brake calipers. Yep, the infamous fake drilled brake disc cover things were nowhere to be seen, but that’s because the part of Jesse’s Jetta was played by more than one car. The good news is, if you really want the ‘no calipers’ car (or at least one of them, depending on how many featured in the film), it’s for sale! So, to clarify, there were many stunt double cars on the set of The Fast And The Furious. The Supra and the Eclipse had the most doubles as they had the most screen time. You will be able to notice subtle changes to the cars between shots, most noticeably the appearance and disappearance of roll-cages. Even the scene when the Eclipse blows up after getting sprayed with bullets, a completely new car was used, strangely enough, even the year model of the wrecked car was five years older than the one used in the beginning sequence and first street race. Jessie's car is no exception. You might notice that the car that was auctioned off as Jessie's car was not the only one used in the film, there was another used for the race wars scene, which had more performance modifications and would not have been practical or cost-effective to be used in the other scenes of the movie. With that said, the scene where Jessie gets killed by a drive-by, the Jetta gets some bullet holes. That too was another replica. To make the production a lot more cost-effective, the director opted to have fake drilled rotors between the rim and actual braking system. So, therefore, the doubled cars would be a lot more indistinguishable and coherent. But, to a true petrolhead, this is an unforgivable mistake. When Brian shows up with the junkyard Supra, Jesse is somewhat surprised to see a 2JZ engine in the car, he has no reason to since it was the only engine available in that generation Supra. Whenever Brian is driving the Eclipse after the police chase, you can hear the car shifting but Brian's hand remains on the steering wheel. Close-up shot of the Charger's engine throttle, the sound of the engine revs up and down doesn't match the throttle positions. Dom's Mazda RX-7 in the first race sounds like it has a Porsche flat 6 turbo engine instead of a 2 rotor (13B) or 3 rotor (20B) Wankel/rotary engine that it originally is supposed to have. When Dom hides his car in the empty building and begins walking down the sidewalk, the cop car that passes him is a Ford Crown Victoria. But when we see it again, it is a Chevrolet Caprice. The floor of the passenger side of Brian's car comes off in the first race yet Dom doesn't seem to need to be wary of this missing floor when he rides with Brian later that night. After the first race, it is acknowledged that Brian's Eclipse has blown its piston rings and requires taking the engine apart for repair. Also, some other kind of damage must have occurred (the manifold, according to his in-car laptop) that caused the floor-pan to fall through. This, however, doesn't affect Brian being able to evade the police and escape at a reasonable speed immediately after. When Brian and Dom are forced into the parking lot by Tran and the other bikers, the car is facing into to the lot, yet when the bikers return to shoot the car, it has suddenly turned around. When Jesse gets ready to race at race wars, we see the Honda S2000 standing next to him. Then Brian asks Jesse who he's racing, and we see the Honda S2000 arriving for the second time. When Brian gets out of the car to check Tran after shooting him off his bike, he clearly slams the door of his Supra as he runs over to him, but when he returns to the car, the door is open. During the race wars, when Jesse is up against Johnny Tran, we see Johnny Tran pull up in his car next to him and he is clearly wearing a buttoned-up black shirt. However, once the ref lifts his hands and waves the signal to go, the next shot of Tran in the car and after the race shows him in a black tank top. After Brian rescues Vince from the truck, the cut shot of the truck driving away shows Vince still stuck on the truck. In Letty's race at Race Wars, her seats change from black racing seats to light grey stock seats, then back to racing seats. When Dominic's Charger hits the truck, the roll cage fitted into Brian's car is clearly visible in many shots. In close-ups and stationary shots, the cage is not present. Ted's shirt alternates between dry and oily between shots during the sequence at Tran's garage. Many of the cars have roll cages which change colours between shots. Toward the end of the film when the three Civics are trying to highjack the truck, the rear spoiler of Dom's car changes style between shots. During the last job, Vince hooked himself to the co-driver's seat, but in few shots later there was no damage to the seat. As Brian is driving up to the gathering before the first race, you can clearly see a hose hanging below his Eclipse. Afterwards, the hose is absent. When Brian is driving up to Dom's store to get a tuna sandwich from Mia, the Ford emblem on the grill of his red pickup is clearly missing. When he drives away after Dom tells him to leave, the Ford emblem appears. When everyone is gathered around Brian's car following the first race, you can see a guy behind Dominic with a black FUBU shirt on and spiky hair, then in the next shot, the same guy is behind Brian. When Brian is testing the top speed of his Eclipse at the beginning of the film, he appears to have 7 forward gears. After seeing him shift into first before starting, you can count 6 more up-shifts after, either by seeing him change gear or by hearing it. When Brian is being interrogated by Dom and Vince after breaking into Hector's workshop, he says Hector has ordered a Motec System Exhaust for the three Civics. Motec is a manufacturer of engine management systems and data collection devices (electronics, basically). Motec does not make and has never made exhaust systems. Johnny Tran isn't happy when he sees two empty engine bays, and suspects Ted of being responsible for selling the Nissan SR20 motors. The problem is that the cars in the shot are Honda's, and couldn't have been fitted with the SR20 engines due to the FWD-RWD difference. When Jesse first pops the hood of the green Eclipse before the first race, you can clearly tell it's a non-turbo eclipse. The car has a non-turbo 420-a motor; not a turbo 4G63T. Also if the Eclipse was truly a 10-second car, it would visibly have a front mount inter-cooler which it never has in the movie. In the first scene of Brian in the Eclipse, he launches the car and only the front wheels spin during takeoff. In the big drag race, the car lunges to one side which would only happen in the GSX all-wheel-drive model. In The Fast and the Furious, on their date, Kia tells Brian that Dom and Letty met when Letty was 11 years old. In Fast and Furious 6, after their race, Dom tells Letty they met at her first street race when she was 15. When Brian spins his Eclipse out while testing it in the stadium parking lot. You can clearly see that the reverse lights are on while the car is spinning. Indicating that they were doing reverse donuts to film the shot. When Johnny Tran shoots and destroys the Green Eclipse after it catches fire, you can clearly see with a camera change, the Eclipse is swapped out from a 1997-1999 styled Eclipse (all the main Eclipses in the movie have the 1997-1999 styled headlamps) to an empty 1995-1996 Eclipse shell. The easiest way to tell is to watch the change in the style of the headlamps to the buldge and damaged front bumper on the driver's side. Also, the rims are changed out before the car explodes. This Dude Found Suki's Honda S2000 From 2 Fast 2 Furious!